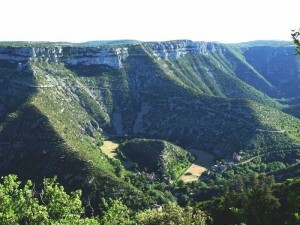 Nestled in the heart of the gorges of the Vis, which seperate the Causse of Blandas (Gard) and that of the Larzac (Hérault), the Cirque de Navacelles is a unique geological feature. Three hundred metres deep, the Cirque is an oxbow lake : a dried-up river meander, left as the Vis forged a more direct route through the landscape, creating an eight metre high waterfall in the process. At the centre, the « Rocher de la Vierge », more commonly known as the « oyster », is surrounded by a strip of very fertile land : the old river bed, the meander. Its green fields, the waterfall and the woodland constrast with the abrupt, dry and stony banks of the gorges, and underline the strange contours. As the local historian Georgette Milhau said : « Navacelles, perhaps more than any other landcape, gives off an inexplicable strangeness ». But the Cirque de Navacelles is not only a geological wonder, it is also the result of a subtle alchemy between Man and Nature. Humans inhabited this rich farming land very early on, and « tamed » it. Today, the Causses’ intricate evolution (small walls called « faïsses », the upkeep of the fields, long, strips of land called « Bayrades ») and the houses grouped together on three small islands squeezed alongside the meander and the Vis, all give the site its particular human aspect, and reinforce the amazing views. With the water perpetually moving, these green landscapes, worked and inhabited, bear witness to the life that exists in the midst of a seemingly « petrified » landscape of gorges and Causses. The emotion felt on discovering the site rests not only in the beauty of the Cirque itself, but also in its sudden appearance at the belvederes of Blandas and of the Baume Auriol, after crossing long stretches of dry Causse. Thus, the « Grand Site » of the Cirque de Navacelles is not only limited to the Cirque, but also includes the gorges of the Vis and the Causses, vast stretches of steppe-like land born of Man’s use of the land, and threatened today by the diminishing uses of the landscape.